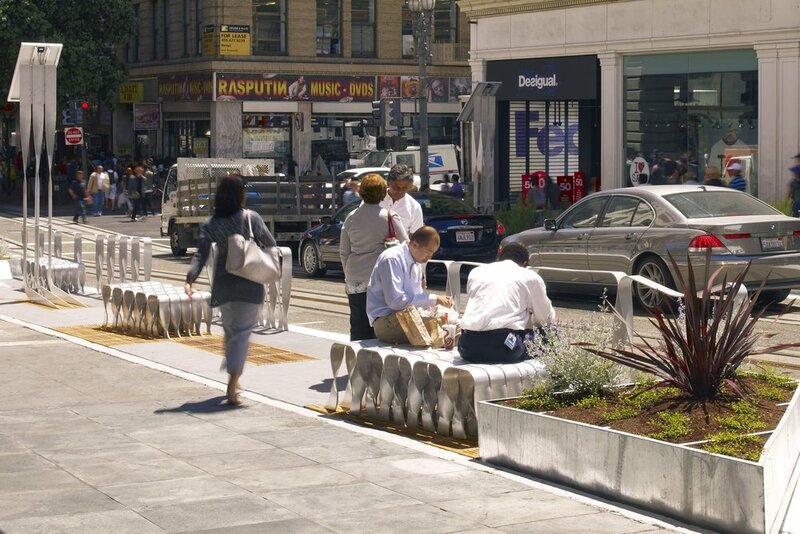 The Powell St. Promenade is an installation spanning two blocks of the busiest pedestrian thoroughfare in San Francisco. Funded by Audi, the Promenade is a 6’ extension of the existing city sidewalk and is made up of aluminum and wood grating. Strips of aluminum emerge from the grating and twist upward to create planters, benches and standing tables, mimicking the contours and framing of the 2012 A7 car. Parking was removed from the street, though the Trolley cars and private vehicles maintain access. The promenade offers refuge for passersby: an opportunity to sit, to drink coffee, to meet a friend before dinner, or to simply stand and people-watch while out of the way of the incessant flow of pedestrian traffic. The six PV towers on the promenade create the energy to power the lights along the walkway at night.